From Goodreads.com: "Katherine Whitney has it all. She’s married, has two daughters, is the COO of Green Goddess & Co., a multi-billion dollar health and wellness lifestyle company, and with the release of her book on work-life balance, she is not only a media darling but she is a hero to working moms everywhere. In reality, though, Katherine’s life is starting to fall apart, and her loyal assistant Lucy Cooper is the one holding most things together. But when Katherine does something unthinkable to Lucy, Lucy is faced with a difficult decision. Will she choose to change Katherine’s life forever or continue being her main champion. Her decision could change the trajectory of both of their lives. The Balance Project is a story of loyalty, choices, and most of all balance as it explores the hot-button issue that all women struggle with." 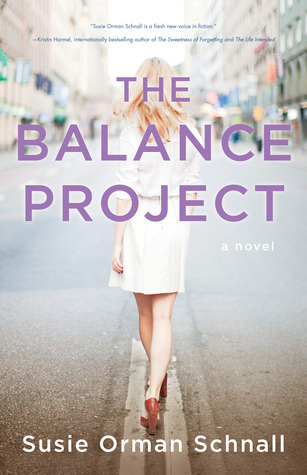 "The Balance Project" is the story of Lucy, a young 20-something trying to make it in New York City. She has ideas about what she wants to do as a career but when an opportunity comes up to work for Katherine Whitney, America's queen of balance, Lucy thinks that's her foot in the door. What she doesn't realize is that Katherine really doesn't have it all figured out and the balance that she preaches about doesn't reflect her real life. Lucy is trying to keep it all together but Katherine's lack of balance seems to bleed into Lucy's life. This is a book about standing up for yourself and following your dreams. It's also the story of how looks can definitely be deceiving. Lucy is a fantastic character. I like that the author told the story from her perspective so we really get a front row seat to all of her dealings with Katherine. Lucy definitely feels like a real person. Anyone who has just been starting out their career will recognize the desperation that Lucy has in trying to hold onto an opportunity that is wreaking havoc on her life. In the beginning of the book, Lucy seems to know what she wants and is trying to hold it all together to get there even if it means pushing away her boyfriend of eight years - she is sure that he will understand! Surprise, surprise, he doesn't understand and Lucy's life descends into greater cause chaos. We see Lucy eventually realize that having it all may look a little bit different than we initially think. I love books that make me feel something and this book definitely made me feel a whole range of emotions. I was legitimately nervous as I watched both Lucy and Katherine's lives unravel. Being a person who favors order, the chaos really grabbed me. The ending of this book was great and I know that it is one that I am going to be thinking about for quite awhile (no spoilers!!!). Between the topic at hand and the pop-culture references, this book is definitely very of the moment. With books like Sheryl Sandberg's "Lean In" and many others, it's hard to get away from the whole "women having it all discussion." As someone who has been in the workforce for awhile and is now a new mom, I know that topic is very much on my mind a lot recently. This book is a fictional look at what that actually means to have it all and how difficult it can actually be to find that balance. It's also the story of how balance looks different for each person. Overall, I enjoyed this section will take on a timely topic!